The essay “Art in Kampala at Work 012” is a kind of case study or reflective report from a quite involved perspective, and it was written five years ago, in 2013, when the memories were still fresh and present. 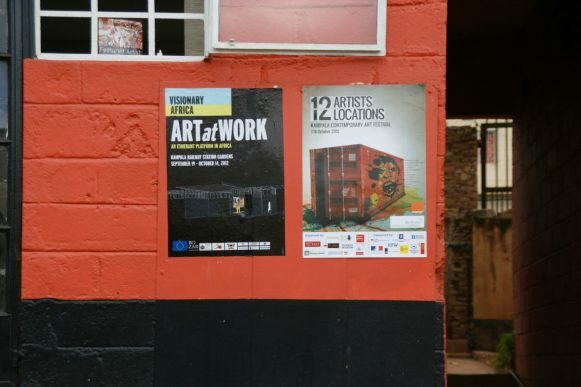 In 2012, two innovative and unusual public art events took place in Kampala: the international exhibition “Art at Work” and the local contemporary art festival KLA ART. Since then, a lot has happened. 2014 saw two biannual art events, the second edition of KLA ART organized by 32° EAST and the launch of the Kampala Art Biennale under the directorship of Afriart director Daudi Karungi. Both these contemporary art festivals are still young and in constant evolution experimenting with concepts and formats which cannot be elaborated further here and now. Fast forward to 2018: the city is buzzing with cultural and art related activities to the extent that the month of August goes under the title of art month. This year, the longstanding Bayimba festival will open for the first time in August and in a new space outside of Kampala at the shores of Lake Victoria. Also, both KAB and KLA ART have scheduled their main public program in August. With the view to these upcoming activities this text reminds us of some of the discussions in the early days of Kampala’s biennalisation and contributes to the writing of the exhibition histories of the city. The essay was originally published in the book “New Spaces for Negotiating Art (and) Histories in Africa” and is re-published here with kind permission of the author and the editors. © Essay, published in: New Spaces for Negotiating Art (and) Histories in Africa. Ed. by K. Pinther, U.-S. C. Nzewi, B. Fischer, Berlin/Münster: Lit-Verlag, 2015. Kampala was the last station of the travelling exhibition project “Art at Work” on a two-year journey across the African continent. The itinerant platform derived from the Visionary Africa festival in Brussels in 2010 and was initiated by internationally renowned curator Simon Njami and architect David Adjaye. After the launch in Tripoli it continued its trip with stations in Ouagadougou, Addis-Ababa, Cairo, Harare and Bujumbura, taking different shapes and sizes according to local circumstances. 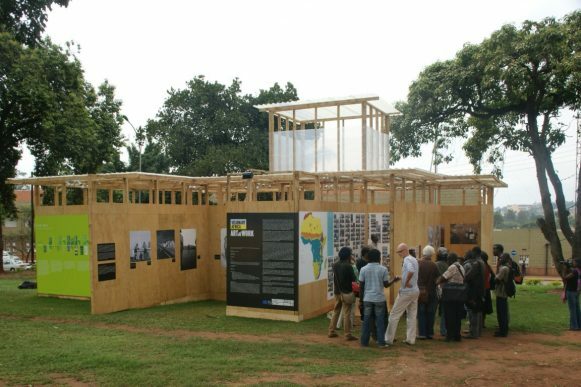 In Kampala the multidisciplinary project was at last realised in its originally planned form including an exhibition pavilion in a public space and accompanying events such as an artist residency, an artists’ workshop, and a conference on art and architecture coinciding with Uganda’s fifty years of independence celebrations. A key aspect of the transitory platform was the creation of links and synergies with existing structures on the ground. One of these, though temporary itself, was the first festival of contemporary art in Uganda: KLA ART 012. Eight arts organisations with diverse backgrounds and structures jointly organised the event, ranging from government-run institutions Uganda Museum and Nommo Gallery, over the public university’s Makerere Art Gallery to alternative art space 32° EAST Ugandan Arts Trust, to name a few. The pilot kicked off under the title “12 Boxes Moving” referring to a dozen twenty-foot shipping containers placed in (semi-) public spaces serving as exhibition cubes for twelve art projects. Both events were created as temporary interventions into the public realm aiming at reaching a broader audience and opening up new spaces for the exploration and expression of art and its history in Kampala. Further, both initiatives opted for a collaborative approach bringing together official agencies and independent stakeholders, thus operating in a middle ground between state-run cultural initiatives and independent positions. The events reflect – albeit in different manifestations – the global phenomenon of “biennalisation” of contemporary art since the early 1990s. However, as Njami points out, a biennale in Africa is not the same as in Europe, describing it rather as a “permanent workshop” serving a number of educational and informational functions on and outside of the continent. Posters Visionary Africa / ART at WORK and KLAART 012. Photo by Katrin Klaphake. Transient art events just as independent art initiatives in the global South are often created in response to the void of a non-existing or very limited cultural infrastructure. Guiding questions for this case study were how the different national and international governmental institutions and independent local organisations worked together, what the implications and intentions of these collaborations were, how they were perceived by participants and audiences, and which impact this had on the local art scene. Uganda, unlike most countries on the continent, has a relatively long history of formal art education, which has not only shaped the development of artistic production but also defined certain notions of traditional, modern and contemporary East African art. This essay focuses on the current situation of contemporary art practices in Kampala through a (self-) critical review of the preconditions, aims, contexts and outcomes of two contemporary and coinciding art events – “Art at Work” and KLA ART 012. In 2012, three anniversaries of Uganda’s political and cultural history coincided: fifty years of independence from British colonial rule, ninety years since the founding of Makerere University and seventy-five years since Margaret Trowell first taught art classes at Makerere Hill. The last-mentioned jubilee happened without much public notice. Yet, the outlines of the development of contemporary art in Uganda are marked by the history of art education in the country. Margaret Trowell (1904-1985), a British Slade School-trained artist and teacher, started her art classes in 1937 at today’s Makerere University, at that time called Makerere College, a technical school founded fifteen years earlier in 1922. Makerere University and its School of Fine Arts are the oldest of their kind in the Eastern African region and the art school remained the only institution for higher art education in the region for many years. Through the first three decades, the art school was characterised by a variety of regional and international influences; students came from all across the Eastern, Central and Southern regions of the continent, the majority of faculty was of European origin or trained in Europe. Artists such as the Kenyan sculptor Gregory Maloba, Berlings Kaunda from Malawi, Zambian painter Henry Tayali, Rosemary Karuga from Kenya, Tanzanian Sam Ntiro, Ugandan painters Francis Musango and Eli Kyeyune as well as sculptors George Kakooza and Francis Nnaggenda all have a history with Makerere School of Fine Arts. The school contributed significantly to the development of art in the region by training artists who then often became art teachers themselves. Trowell had a great passion for formerly called indigenous arts and crafts, and also engaged in the Uganda Museum founded under British colonial rule in 1908. She extensively researched and documented so-called tribal arts and designs, and contributed considerably to cataloguing Ugandan artefacts and crafts. This research informed her understanding of East African art beyond the dominant Western definitions of mere crafts. Trowell questioned the distinction between higher forms of art versus craftsmanship by re-evaluating traditional designs as forms of art in their own right, which to this day informs investigations into artistic roots and a local historic dimension. To give an example, in April 2014 Rose Kirumira presented with her new body of work entitled Archives – Tradition and Artistic Inspiration, contemporary interpretations of patterns and forms of traditional objects based on a research into the local material culture in which Trowell’s observations and drawings were pivotal. As a persuaded Christian, Trowell believed in a deep correlation between art and religion. In painting and sculpture she promoted a narrative subject and style, and the depiction of what she believed to be genuinely African subjects and perceptions. Her pedagogy reflected the political idea of indirect rule of British colonialism. Drawing from teaching methods developed for the art education of children she discarded the use of visual examples and recommended instead the medium of story telling to evoke imagination. Trowell encouraged motifs based in rural settings and religious topics, rejecting not only the formalism of modern art styles deriving from the Western world but also themes like the fast-developing urbanity. According to art historian Sunanda K. Sanyal her approach to art education entailed a profound unawareness of the nature of the instructors’ – and hence her own – impact. Despite the structural paradox in the underlying ideology of authentic “Africaness” as unspoilt by (Western style) education, or practices of collecting and research – an ideology which is partly still persistent in the Western perception of contemporary art from Africa – Trowell engaged relentlessly in the build up of an art institution. The establishment of a fully-fledged art school on tertiary level was the result of her dedication to the cause. When Trowell resigned in 1958, the school was named after her in honour of her efforts and achievements. After a structural reform in the 1990s, which emphasised applied art disciplines, it got its current name: Margaret Trowell School of Industrial and Fine Arts (MTSIFA). Kasfir observed that the reading of Todd’s role in the school’s history changed over the years from the anti-colonial criticism of the 1960s to a reinterpretation in the sense of an “enlightened ‘internationalism’” among a younger generation of artists in the 1990s. In retrospect, the art of the post-independence time of “lost illusions” (as Njami put it in “A Useful Dream”) triggered quite some international interest. In 1985, Jonathan Kingdon invited Makerere artists to display their works in a show entitled “The art that survives: Uganda ’60s-’80s: the Makerere Community of Artists work, from before during and after the Idi Amin regime”, held at the Africa Centre Gallery in London. During the 1990s more exhibitions followed, for example in Vienna 1992, again in London in the context of “Africa 95”, and a group show in Germany in 1996. On the continent, a number of Ugandan artists participated in the first Johannesburg Biennale in 1995. With the growing political stability and security in the country, and the economic recovery since Museveni took power in 1986, many artists appear to have shifted their focus to predominantly decorative marketable work directed to the taste of a primarily Western clientele. A handful of commercial art galleries such as Afriart, Umoja or AKA gallery in Kampala cater for tourists and art buyers mostly from the expatriate community, hence an artificial and transitory market driven by foreign money overshadows the scene. Despite the dominance of art as commodity there is also a continuity of critical approaches in the visual arts as Angelo Kakande argues in his doctoral thesis: Contemporary Art in Uganda: A Nexus Between Art and Politics (2008). However, the lack of documentation and collection of visual arts on an institutional level obstructs research and art history. A national art gallery exists in name only and the national museum has no mandate to collect art. The art school’s gallery – the Makerere Art Gallery – was founded as exhibition space in 1969 and holds a collection of art works from the last fifty years. To this day, it is the only fairly comprehensive art collection and the only purpose-built gallery in Uganda. Even though it is open to everyone, its location within the gated campus of the prestigious Makerere University is a hurdle for many people from outside the university environment. The collection, though in fact primarily an account of art education in Uganda, is an important resource for national and international scholars. Interest in the history of art in Uganda is growing and several dissertations have been carried out; for example, the theses of Sanyal (2000), Kasule (2003), Kyeyune (2003), Kakande (2008), Kirumira (2008), and Tumusiime (2010) among others. Yet, art history, albeit being a core course, is not very popular with students partly because it still follows a primarily Western art history curriculum. It is only quite recently that lecturers, spearheaded by George Kyeyune who is working on the development of an African art history curriculum, are offering more Africa-focused subjects in their lectures. The Margaret Trowell School of Fine and Industrial Arts (MTSIFA) is not the only art school in Uganda anymore; Kyambogo University, the second public university in Kampala, has a Department of Art and Industrial Design, and a number of private art schools have emerged like Michelangelo College of Creative Arts, Kisubi (founded 1989), or Nagenda International Academy of Art and Design (NIAAD) in Namulanda (founded 2009) between Kampala and Entebbe. The art and design faculty at Kyambogo University developed from a department at the school for teacher education into an independent faculty. As mentioned before, the shift in focus from fine arts to applied arts which was embedded at MTSIFA in the course of a reformation of the programmes and curricula in the 1990s also informs the course development of other art education institutions. The rationale behind this is the objective to deliver classes that help to provide better job prospects in graphics, textile, fashion, and product design. Kizito Maria Kasule, an internationally renowned artist and senior lecturer at MTSIFA, founded NIAAD as alternative option addressing also younger students who are eligible for university admission. Despite the pluralisation of schools, links between all these institutions remain still quite strong due to the fact that the majority of lecturers received their education at MTSIFA. “Visionary Africa” was a multi-disciplinary arts event comprising visual art exhibitions, literature, music, performances and discussions organised by the Centre for Fine Arts BOZAR and the Royal Museum for Central Africa, Tervuren on the occasion of the fiftieth anniversary of the independence of the Democratic Republic of Congo and other African Countries in 2010. One of the centrepieces of the ambitious event was the exhibition “GEO-graphics – A map of ART practices in AFRICA, past and present” juxtaposing ‘traditional’ African art with contemporary art works, and complemented by a platform for eight independent art centres from the continent, under the artistic direction of renowned British-Ghanaian architect David Adjaye and co-curated by Anne-Marie Bouttiaux, Koyo Kouoh, and Nicola Setari. While the organisers intended a re-contextualisation of the more than 220 ethnographic objects by contrasting them with contemporary art works, Jelle Bouwhuis criticised precisely the lack of contextualisation through a mere art presentation overwhelmingly dominated by “colonial trophies” without “any serious attempt to relate the ethnographic pomp with contemporary art and art practices”. “A Useful Dream. African Photography 1960-2010”, curated by Simon Njami was the other big exhibition of the Visionary Africa event. Together Adjaye and Njami then developed a concept for an exhibition that could travel to different countries in Africa on the occasion of their independence celebrations, taking into account that the majority of exhibitions of art from Africa take place in Europe or the USA and to take at least some of the exhibits back to their place of origin. It became the first cultural project jointly supported by the European Union and the African Union. Curators and initiators Njami and Adjaye envisioned the project as an experiment, a proposition with an almost fluid structure allowing for interaction. The structure of the pavilion intended the materialisation of this vision. Adjaye further contributed his model and interpretation of Africa’s geographic regions visualised by a grid of his own photographs from African capitals mounted in columns according to their geography. A selection of photographs from the “A Useful Dream” exhibition by Simon Njami printed in large format on vinyl and simply pasted on the plain wooden walls was the artistic heart piece; these were impressive photographs by different predominantly African photographers reflecting moments of half a century of African history. A third space was dedicated to the local partners and changed at every location. In Kampala it comprised historical and contemporary photographs; the exhibition entitled “Traces and Routes” followed the topic of histories and transition. The latter was also visualised by the display of covers of the magazine Transition from the 1960s. The historical photographs were selected from three Ugandan archives ranging from lantern slides dated from around 1900 to modern views of the independence decade. Here the approach of the History in Progress (HIP) Uganda project was adopted by displaying some of the photographs with comments people had posted on their Facebook site identifying people, places or situations. The contemporary section contained works by young Ugandan photographers. It was a curatorial decision to focus on photography in the local section even though, or rather because, photography is not a very popular artistic field in Uganda. The curatorial team intended to show the potential and relevance of photography as medium of artistic practice but also for reasons of production as the pavilion was an entirely open structure original artworks could not be displayed. The aim was to create a theme-based group exhibition, which is not the usual practice in the Ugandan arts environment where solo shows of individual artists are by far the most common type of exhibition. In his essay Of Curating and Audiences Njami reflects on exhibitions situated in public spaces outside of a state-administered organisation and their audience focusing on the ‘ordinary people’ in the environment of African cities. He opposes this kind of exogenous organisation belonging to the public sphere to “an endogenous organisation that emanates from human beings, from citizens” which belongs to the private sphere. Njami sees appropriation and reinterpretation that have often been described as powerful tools of popular audiences especially in non-Western countries as central to ‘open’ exhibitions, which he qualifies as structures with “no intermediary between the sponsor and the user”. In this sense he characterises the proposed project of “Art at Work” as one that positions itself at “the intersection of the public and the private”. Through collaboration with ministries and the delegation of the European Union (EU) the organisers of “Art at Work” got permission to place the pavilion in the railway gardens right in the city centre, where it had ideal public exposure. The use of urban public spaces requires official permission and comes with surveillance and security measures; in other words it has to be sanctioned by the state authorities. Whether this makes it part of an official culture remains a question, as this is also exactly the sphere where the aforementioned options of appropriation and reinterpretation come into play. Guest book entries and personal conversations prove that many people enjoyed and commended location and display. The visitors related very well to the photographs of the “Useful Dream” section and the local section, the opening of the historic and spatial dimension in an African perspective. Looking at the other elements of the project, the multiple and complex layers of aims and expectations on all sides, organisers, participants and audiences, become more apparent. Important in this context are the categories of knowledge, language, position and relations, open and closed spaces. In other words: Who speaks to whom, what do they say, and where? A key statement in the press release for the launch of the travelling exhibition project “Visionary Africa: Art at Work in Tripoli” in 2010 was: “This project focuses on the importance of culture and creativity as development tools and is directly in line with the Brussels Declaration by Artists and Cultural Professionals.” In the information for the press in Kampala two years and six stops later, the statement was amended: “[…] the Exhibition’s intent is to focus on the importance of culture and creativity as a motor for development. The aim is to further to provide, through the work of artists, a snapshot of transformations that have occurred on the African continent during the last half century, as well as put its future development into perspective.” A wording that better reflects the existence of regional structures and their evolution on the continent by explicitly acknowledging that the project comes at a time of fifty years of social and political history under post-colonial conditions. The entire project was envisioned as multidisciplinary and interactive event involving partners on governmental level as well as the local arts community. The activities included a three-week artist residency by Congolese sculptor Freddy Tsimba, who worked at the Makerere art school and later donated his sculpture to the Uganda Museum. In addition, a workshop led by Simon Njami and Marilyn Douala Bell focused on discussions around the upcoming KLA ART 012 festival with participating artists and organisers, and a regional conference was held on “How art and architecture can make city development inclusive and sustainable”. The conference included government officials, EU representatives, architects and artists targeting issues of cooperation between policymakers and stakeholders and resulted in the Declaration of Kampala. In hindsight, this meeting heralded the start of a stronger emphasis on the role of arts and architecture in the development of African cities for future phases of the project. The final publication appeared under the title Visionary Urban Africa. The one-day symposium took place in Kampala’s old City Hall which is a small colonial building hidden behind the modern office tower of Kampala Capital City Authority (KCCA), usually a completely closed space. Entering the colonial hall with a gallery of Mayors’ portraits dating back to colonial times was a remarkable experience in itself. In the more intimate setting of the artists’ workshop the above-mentioned questions emerged with all sensitivities. Again, the meeting was held in a late colonial structure, the Uganda Museum. Retrospectively, it becomes apparent how this venue unintentionally mirrored some of the inherent conflicts in the group and the whole setting. While the intention was to include the museum, an otherwise not overly active or art-related government institution, in a contemporary discussion, the atmosphere of the building seemed to bring not only reminders to the room of colonial ‘museumisation’ but also the current government’s total disregard of arts. Hence some of the participants mistook the forum as a platform for complaints and demands to the address of the government, while others became quite defensive in general. The big and powerful intervention of the entire event, despite all its inclusive ideals, was perceived with some suspicion from the view of the local artists. One reason being the fact that there were no previous links or collaborations in place to build on and not much information about the ‘mother project’ was provided. Out of the eight independent art spaces that were part of the exhibition in Brussels, only Darb 1718 in Cairo later hosted the travelling part. All other locations in Africa were identified differently whereby the selection criteria were somewhat unclear. Given the prominence and background of the facilitators, the workshop format was intrinsically linked to notions of education and development. Development as a concept inevitably implies unequal power relations. The perception of ‘here’ and ‘there’, ‘inside’ and ‘outside’ was expressed in the workshop and revealed divides related to the power of knowledge and infrastructure as well as reflected but also less conscious positions of nationalism. Another heavily contested topic was the ideal or target audience; almost every Ugandan artist would reply to this question like a shot: my people, the ordinary Ugandans. But it became obvious in the debates that the attention of an informed audience is equally important and that social recognition in the local environment is a strong desire. Compared to the large group of practising artists, there is hardly any critical writing or theoretical discourse in place locally, and therefore no language to express critical thinking or experience to accept it. Critique from outside, on the other hand, is easily rejected under the pretext of a lack of information about local topics and conditions leading to a withdrawal into the comfort zones. In this sense, it was remarkable that the exhibition opening at the pavilion was well attended including significant political leaders like the vice president and ministers. In the bigger interest of the recognition of visual arts this is a small but undeniable step in a relevant direction. The first festival of contemporary art in Kampala was smaller in scope, inviting only artists from or residing in Uganda, yet similar to the aforementioned project in taking to the streets and in terms of an inclusive approach on the organizational level by forming a committee comprising very diverse stakeholders: public university gallery Makerere Art Gallery/IHCR, and government institutions Nommo Gallery and Uganda Museum, foreign cultural institutions Alliance Française Kampala and Goethe-Zentrum Kampala/UGCS, private commercial galleries Afriart Gallery and AKA Gallery, and newly founded independent arts organisation 32° East | Ugandan Arts Trust. The idea for the festival was born when the East African Art Biennale (EASTAFAB), founded in 2003 in Dar es Salaam, had to cancel its plan to have the exhibition travel to the East African member countries. KLA ART invited artists to reply to an open call and long-list candidates were selected on the basis of project proposals. 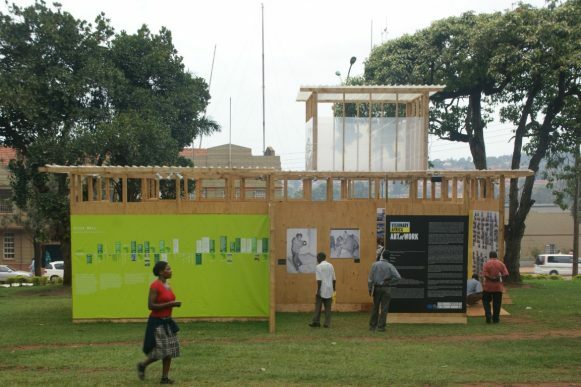 Twelve projects were chosen and exhibited for one week in shipping containers at different locations all over Kampala. Some were placed near the venues of the arts organisations, others in busy public spaces like the industrial area and the city centre, two of them in close proximity to the “Art at Work” pavilion. The application process met some criticism within the artists’ community because many artists were not used to going through such a procedure and strongly rejected any idea of selection. In fact, a good number of the more established artists chose not to enter the competition. The entire process involved many artists’ meetings and group discussions before and during the festival week. An international jury had been invited to situate the festival and the individual works in a broader context. They engaged in thorough discussions with the artists, assessing the projects and providing critical feedback. KLA ART 012 was a pilot, an experiment in many ways, from the offset with the intention of following editions in two or three year intervals. The main aims were to create new physical and mental spaces for visual art projects and to interact with new and different audiences. The festival was strictly non-commercial to allow for ideas beyond a direct saleability. Artistic practice in Uganda primarily comprises painting and figurative sculpture, be it for the expatriate market or less commercial. More recently, artists have embarked also on installations, exploring different materials and formats and tackling social and environmental issues. Working with scrap, plastics and other found objects has become quite popular; Bruno Ruganzu for instance, is a very active “eco-artist” promoting his cause on TedX events nationally and internationally. Media art is far less common. This has to do with the available training but also with the existing gallery spaces and interests. As mentioned before, exhibition making in Uganda was mostly limited to the organisation of solo shows with little or no critical curatorial framework. In this sense, the festival had a visionary, experimental aspect, attempting to open up a space for new artistic but also curatorial approaches. The concept was successful in some of the projects and not at all in others, while a decisive curatorial vision and guidance got lost in the big and heterogeneous group of organisers. Nevertheless, the outcomes in terms of new experiences in artistic practice and audience interaction were successful and much appreciated by the participating artists. In general, the festival intended to operate grounded in the local environment; for example, by restricting participation to the Ugandan artists’ community and opting for shipping containers as exhibition spaces, which are very common multipurpose structures in the cityscape. The targeted audience in this case were indeed the people in the streets, passing by on their way to work or school. The artists and volunteers were at the sites all day and performances, workshops and talks were held to create audience interaction. Lilian Nabulime for example, who had a container on a main road next to Kampala University displaying her project “Bypassing Literacy: Sculptural Forms as a Communication Tool in the Fight against HIV/AIDS”, spent all day showing and discussing her work to students, street vendors and other passers-by-. Ronex Ahimbisibwe built an open metal construction in the shape and dimensions of a container placed near railway tracks that are used as a highly frequented footpath between the city centre and remoter residential areas. Sculptural elements and frames plastered with newspaper clippings invited people to leave written comments. The space became a real meeting point buzzing with discussions. Also Waswad’s leopard skin painted container next to the “Art at Work” pavilion drew so much attention that the police had to disperse the crowd, stopping a cultural performance. Among many Ugandan artists, Margaret Trowell’s legacy is latently persistent to this day. Regarding the quest for identity, her Africa-centred model is mirrored in a strong local focus and a certain national pride – or at least negotiations of it. In the artist statement for the earlier mentioned show “Archives” Rose Kirumira states that the main purpose of her exhibition was “to create awareness for Uganda’s material culture and take part in a discussion on collective nationalism and its relevance (or relationship with) the artisanal skills developed by our ancestry.” Another example is the art project “DaudiMzili” by artists Daudi Karungi and Henry Mzili, who explicitly characterise their style as “indigenous expressionism”. Whereby the ethnographic term ‘indigenous’ is connoted as positive quality in the sense of local rootedness and used as synonym for authentic. In regard to the authenticity debate in relation to African art this serves several purposes: an active positioning, claiming that the artists themself are the rightfully entitled agency to qualify their work as authentic, and a marketing trick addressing the foreign client’s desire for authentic art from Africa, as well as, lastly, their own desire to create an identity-establishing branding of their work based on a local originality which is inseparable from the notion of a genuine culture. Trowell’s (motherly) protective approach of rejecting certain outside influences seems to shine through in a tendency to inward orientation paired with a neglect of more universal or systemic issues in the arts. The long history of formal art education has created a role and place for the visual arts, however marginalised they might be. Breaking free from the restrictions that come with formalisations within the university environment, with notions of academic correctness and national narratives, in a direction that allows for other critical forms of theory and practice formation is a long but important process. The two discussed events – one from outside, the other from a more local perspective – achieved some movement in that direction. In 2014, the second edition KLA ART 014 will take place in Kampala. Spirit and aims remain the same as in 2012 but the organisational structure has changed; 32° East | Ugandan Arts Trust has become the main organiser while most of the former stakeholders now contribute on a partner level. With this modified leadership the focus has shifted towards intensified capacity development throughout the year. In preparation of the festival month October, many activities and workshops are being carried out and a young curatorial team has been installed. The event comprises three elements: an exhibition at Kampala Railway Station, the Boda Boda Project, which is a public art project with motorbike taxis, and an Artists’ Studios tour. Thirty artists in total from Uganda and Uganda’s neighbouring countries have been invited to respond to the theme “Unmapped”. Interrogating the paradigms of artistic production and exhibition-making in the post-colony, questioning how knowledge in art is generated and disseminated, how the past informs the present, analysing the role of language and communication, are some of the issues that will have to be discussed. The coinciding events of “Art at Work” and KLA ART 012 complemented each other; the local festival situated in the here-and-now generated direct interactions with the audience that the visiting event could structurally not achieve, while the incoming project brought in a historic and broader point of view, and a continental perspective. KLA ART 012 was exceptional; never before in Uganda had so many different cultural organisations teamed up to collaboratively organise an art event in the city space with the intention to open up to other practices by encouraging debates and inviting international visitors. But also the government collaboration in the case of “Art at Work” was a novelty and has sparked a slightly increased interest in cultural events on the part of some ministries. The temporary pop-up confrontations generated discussions and set energies free, maybe not as direct tangible outcome but in shaking up exiting structures and unlocking perspectives on how to interrogate and re-position artistic and curatorial practices. See for example Esche’s overview of the paradigm shift in exhibition history after 1989 towards curator-centred exhibitions taking on socio-political issues and the inclusion of global artists in major art events as well as the founding of new biennales all over the world. Charles Esche 2011, Making Art Global: A Good Place or a No Place?, in: Rachel Weiss et al. Making Art Global (Part 1). The Third Havana Biennial, 1989, London, p. 8-13. “Une biennale en Afrique, c’est un workshop permanent, un laboratoire qui touche à un tas de fonctions. C’est à la fois de l’information, c’est à la fois de l’éducation et c’est à la fois une plateforme… à la fois pour l’Afrique et pour l’extérieur de l’Afrique. Lorsque je parle de workshop, je veux dire une école permanente : apprendre aux gens comment on réceptionne ces objets, comment on monte une exposition, comment on réfléchit pour créer l’accueil de ces objets.“ (A biennale in Africa is a permanent workshop, a laboratory with a variety of functions like information, education and serving as a platform… for Africa and outside of Africa at the same time. When I’m speaking of a workshop, I’m actually speaking of a school: the teaching of how the reception of objects works, how to install exhibitions, how to think about the mediation of those objects. Translation KPK) Cedric Vincent 2008, Instrumentaliser l’événementiel. Entretien de Cédric Vincent avec Simon Njami, in: ibid. (ed.) Festivals et biennales d’Afrique : machine ou utopie?, Paris, p. 102-109, here p. 102. The author is the curator at Makerere Art Gallery/IHCR, a public university gallery. She has co-curated the local section of the “Art at Work” exhibition and is a founding member of KLA ART. 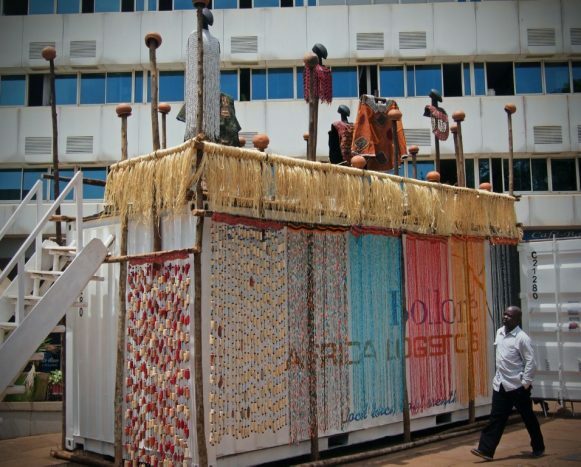 “Visionary Africa: Art at Work” in Kampala 19 September – 14 October, 2012 and KLA ART 012, Kampala Contemporary Art Festival, “12 Boxes Moving”, 7 – 14, 2012. Margaret Trowell and Klaus P. Wachsman 1953, Tribal crafts of Uganda. London, New York. “The show is part of my awareness of culture as a primary [re]source for visual expressions.” Rose Kirumira 2014, Archives – Tradition and Artistic Inspiration, Kampala, (self-published catalogue); sculpture exhibition at Makerere Art Gallery/IHCR 10 April – 6 May 2014. Trowell discusses her philosophy and approaches to teaching in several publications. Among them: Margaret Trowell 1937, African Arts and Crafts. Their Development in the School, London; Margaret Trowell 1947, Modern African Art in East Africa, Man (Jan.): 1–7. See Elsbeth Court 1985, Margaret Trowell and the development of art education in East Africa, Art Education 38/6: 35–41, and Chapter III in Angelo Kakande 2008, Contemporary art in Uganda: a nexus between art and politics, Dissertation, University of the Witwatersrand, Johannesburg. Sunanda K. Sanyal 2006, Modernism and cultural politics in East Africa: Cecil Todd’s drawings of the Uganda Martyrs, African Art 39/1: 50-59, 94, here p. 58,59. See for example Kasfir’s discussion on the impossible desire to acquire – or here to promote the production of – authentic objects stating that “[…] one cannot escape the internal contradiction in the working definition of authenticity – namely that it excludes ‘contamination’ (to continue the specimen metaphor) while at the same time requiring it in the form of the collector.” Sidney Littlefield Kasfir 1992, African Art and Authenticity: A Text with a Shadow, African Arts 25/2: 41-53, 96-97. Cecil Todd 1961, Introduction, in: Sorsbie Gallery (ed. ), Art & Africa. An Exhibition Celebrating the Independence of Tanganyika. Kampala, p. 3-5, here p. 4. Sidney Littlefield Kasfir 1999, Contemporary African Art, London, p. 146. Ibrahim Noor 1966, Art in Africa – backwards or forwards?, Transition 27: 39-41, here p. 39, retrieved on 13 August 2011 from http://www.jstor.org/stable/2934201. George Kyeyune 2003, Art in Uganda in the 20th century, unpublished dissertation, School of Oriental and African Studies, University of London, London, p. 155. Simon Njami 2010a, A Useful Dream: African Photography –1960-2010, Brussels. Nadir Tharani 1985, The Art that Survives – The Makerere School of Fine Art, Africa Events (February), retrieved on 27 June 2011 from http://www.nadirtharani.com/articles/. Fabian Mpagi, Geoffrey Mukasa, and Francis Nnaggenda, Uganda Modern Art, 1992, Wien; Cle?mentine Deliss 1995, Seven Stories About Modern Art in Africa, Paris; Rose-Marie Rychner 1996, Contemporary Art in Uganda, Aschaffenburg. By analysing Ugandan art of the last two decades in a wider socio-political context Kakanda traces a continuity of sensitivity and criticism towards social and political conditions in contemporary artistic practices. See: Kakande (2008). The state-owned Nommo Gallery was established to perform as such but as a neglected government institution it has meanwhile sunk into oblivion. African Arts 4/1: 50-52, and Kyeyune (2003), p. 122. Sunanda K. Sanyal 2000, Imaging art, making history: two generations of Makerere artists, unpublished dissertation, Emory University, Atlanta; Kizito Maria Kasule 2003, The Renaissance of Contemporary Art at Makerere University Art School, unpublished dissertation, Makerere University, Kampala; Kyeyune (2003); Rose Namubiru Kirumira 2008, The formation of contemporary visual artists in Africa: Revisiting residency programmes, unpublished dissertation, Makerere University, Kampala; Kakande (2008); Amanda Tumusiime 2010, Art and gender: Imag(in)ing the new woman in contemporary Ugandan art, unpublished dissertation, University of South Africa, Pretoria. Kakande and Tumusiime have recently received a grant for publication. David Adjaye and Emiliano Battista 2010, Geo-graphics: a map of art practices in Africa, past and present, Milano. Koyo Kouoh, director of Raw Material Company, selected the participating art spaces CCAEA Nairobi, Kenya; CCA Lagos, Nigeria; Darb 1718, Egypt; Doual’art, Cameroon; L’appartement 22, Morocco; La Rotonde des Arts, Ivory Coast; Picha, DR Congo; and her own organisation Raw Material Company, Senegal. “Held at the CFA, GEO-graphics, the festival’s main exhibition, sets out to recontextualise more than 220 objects of breath-taking beauty from the Museum and from other Belgian public and private collections by bringing them face to face with the work of contemporary African artists.” Retrieved on 27 October 2013 from http://www.bozar.be/activity.php?id=9134&lng=en. Jelle Bouwhuis 2010, The many ambitions of GEO-graphics, retrieved on 1 November 2013 from http://universes-in-universe.org/eng/nafas/articles/2010/geo_graphics. David Adjaye 2010, The City Pavilions: Pop-Ups for Art, in: BOZAR Centre for Fine Arts (ed. ), Visionary Africa: Art at Work, Brussels, pp. 16-21, here p. 19. Simon Njami 2010b, Of Curating and Audiences, in: BOZAR Centre for Fine Arts (ed. ),Visionary Africa: Art at Work, Brussels, pp. 27-32. Curated by Margaret Nagawa and Katrin Peters-Klaphake. The Kaddu Wasswa Archive, Deo Kyakulagira/Central Art Studio Limited, and Gayaza High School. Retrieved on 17 May 2014 from http://hipuganda.org. Edward Echwalu, Okujo Atiku Prynce, Rumanzi Canon, Oscar Kibuuka Mukisa and Peter Tukei. Brussels Declaration of artists, culture professionals, and culture entrepreneurs, 3 April 2009, retrieved on 5 November 2013 from http://cms.ifa.de/pdf/ke/eu_brusdec2009.pdf. Text of the declaration can be found online: http://capacity4dev.ec.europa.eu/culture-and-development-international-cooperation/document/declaration-kampala. A harsh critical debate on social media followed ascribing organisers and participants to neo-colonial attitudes. 32° East | Ugandan Arts Trust is an not-for-profit organisation initiated by The African Arts Trust, a British foundation, and conceptualised by British art practitioners Rocca Gutteridge and Nicola Elphinstone with the goal to create structures for contemporary art practice and informal education. A few years earlier, a similar local artist-led initiative – the Ngoma workshop – founded and run by Rose Kirumira in 1995 and part of the Triangle Network, had gone dormant when Kirumira embarked on her PhD. The participating artists were: sculptors Ivan Allan Bwambale and Lillian Mary Nabulime, British-Ugandan conceptual working artist Emma Wolukau-Wanambwa, multi-media painter Eria ‘Sane’ Nsubuga, new media artist Eric Mukalazi, Ronex Ahimbisibwe and Sanaa Gateja experimenting with different materials; Waswad including performance, fashion artist Stella Atal, British painter Sue Crozier Thorburn, eco-artist Ruganzu Bruno and Xenson working with plastic waste materials. Jury members: Raphael Chikukwa, curator of the National Gallery in Harare; Sylvia Gichia, Director of Kuona Trust in Nairobi; Danda Jaroljmek Director of the newly founded Circle Art Agency, Nairobi; Nadine Siegert from the Iwalewa Haus in Bayreuth; George Kyeyune, Ugandan artist and scholar. Mandate of the jury was to award three residencies tentatively called international (Iwalewa Haus, Germany) awarded to Ronex Ahimbisibwe, regional (Kuona Trust, Kenya) won by Ivan Bwambale, and local (32° East, Uganda) gained by Xenson.